Some cool invigorating autumn weather is just around the corner. 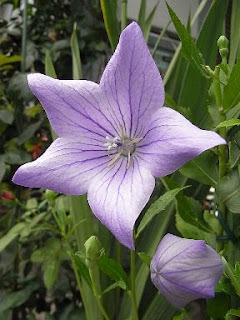 balloon flower(桔梗,kikyou) is one of seven autumnal flowers including bush clover(萩,hagi), Japanese pampas grass(薄,susuki), kudzu(葛), fringed pink(撫子,nadeshiko), Patrinia scabiosifolia or golden lace(女郎花,ominaeshi), thoroughwort(藤袴,fujibakama) and balloon flower. 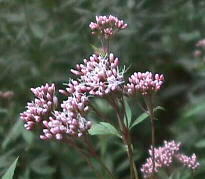 These flowers are blooming in August and September. 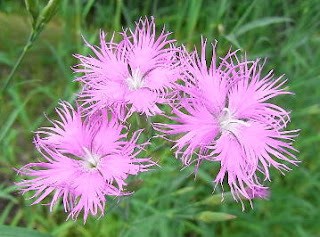 Originally nadeshiko(fringed pink) meant caressing a child's head. It came to mean charming young woman. Yamato-Nadeshiko(大和撫子) means the ideal Japanese woman who is neat and clean, modest and saves men's faces. Another name for nadeshiko(fringed pink) is tokonatsu(常夏) which means everlasting summer. Toko of tokonatsu have the same meaning of bed, and tokonatsu came to be associated with love relationship. Tokonatsu is also the 26th chapter's title of "The Tale of Genji" written by Murasaki Shikibu. 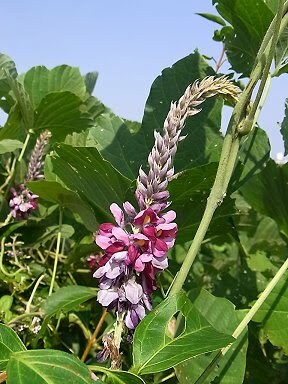 kudzu(葛) was used as a highly nutritious cattle food. Plant fiber was made of its stems. Its vines were used to bind up firewood. Its rhizomes are used as a coagulant. Now it is regarded as a nuisance.